Aaron Ramsey and Mesut Ozil have sent messages to the Arsenal fans after their 3-0 win over Rennes that has sent them into the UEFA Europa League quarter finals. The gunners have qualified for the UEFA Europa League quarter finals thanks to a great performance from the Arsenal squad, the players looked very confident at the Emirates Stadium as always and they will be hoping to go through up-to the finals. Mesut Ozil and Aaron Ramsey were in the starting eleven that faced Rennes and they both had an incredible performance. 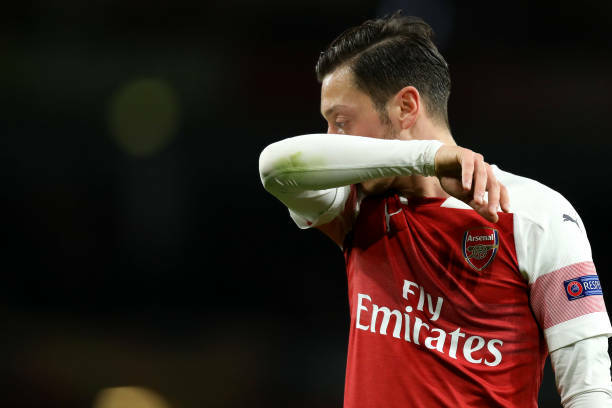 Most of the Arsenal supporters did not expect to see Mesut Ozil in the lineup because Henrikh Mkhitaryan is back in the squad but the midfielder was once again in the starting squad. The German international did not have a bad performance in the first half because he was involved in the build up that led to Aubameyang’s opener and later sent in a beautiful cross but the Gabonese striker failed to put into the ball back of the net. Mesut Ozil was however subbed off in the second half because he was giving away the ball many times and got replaced by Henrikh Mkhitaryan. The midfielder went to Twitter to send a message to the Arsenal fans after the match. Aaron Ramsey was also in the starting eleven that welcomed Rennes at the Emirates Stadium and the Welshman once again put on an incredible performance even though he is leaving the North London club in the summer. Ramsey was the one who assisted Aubameyang’s first goal.